Former VfB Stuttgart and FC Bayern München striker Mario Gomez is back in favour for Die Nationalmannschaft. A Bundesliga record transfer when he swapped first club Stuttgart for FC Bayern in 2009, Gomez won the Torjägerkanone with 28 goals in his second season in Bavaria. A three-time Bundesliga champion who won the treble in Munich as recently as the 2012/13 campaign, there should perhaps be little surprise that Gomez - still one month shy of his 31st birthday - will be one of the first names on Joachim Löw's teamsheet when Germany go in search of a fourth UEFA European Championship. However, it was not ever thus. "It was my big motivation to be part of this great [Germany] team once more," said Gomez, looking back on a successful 2015/16 campaign that saw him fire Besiktas JK to the Turkish Süper Lig title with a league-high 26 goals. "Now I'm just proud and happy that I am going [to EURO 2016]." "There was no call," said Gomez of his omission from Löw's 23-man party. "Obviously 2014 was hard. I had already anticipated that I might not go to Brazil because I was injured for a long time, but I always had a little hope. When he [Löw] announced that I was not going, I was disappointed. It became real at this moment. That hurt." Between a September 2014 4-2 friendly defeat to Argentina and a 2-0 loss to France last November, Gomez spent an unfortunately fitting 13 games in the international wilderness. At club level, his move from Bayern to ACF Fiorentina in July 2013 failed to live up to expectations, with Gomez finding the target just seven times in two years before last summer's loan transfer to Besiktas. Once again, injuries played their role, but they were not alone in holding up the striker's progress in Italy. Spain might have been an ideal semi-retirement destination for Gomez, who, as his full name Mario Gomez Garcia betrays, is of Spanish extraction. Gomez was born in the Baden-Württemberg town of Riedlingen to a German mother and a father - Jose 'Pepe' Gomez Garcia - who hails from a village in Granada near Spain's southern coast. Instead, Gomez has rediscovered his goalscoring touch at the opposite end of the Mediterranean basin, firing the Istanbul-based Black Eagles to their first top-flight triumph in seven years. Return to the national team Gomez has, and with a vengeance. Germany's results may have been stuttering in recent weeks and months, but the striker's own form has been anything but. 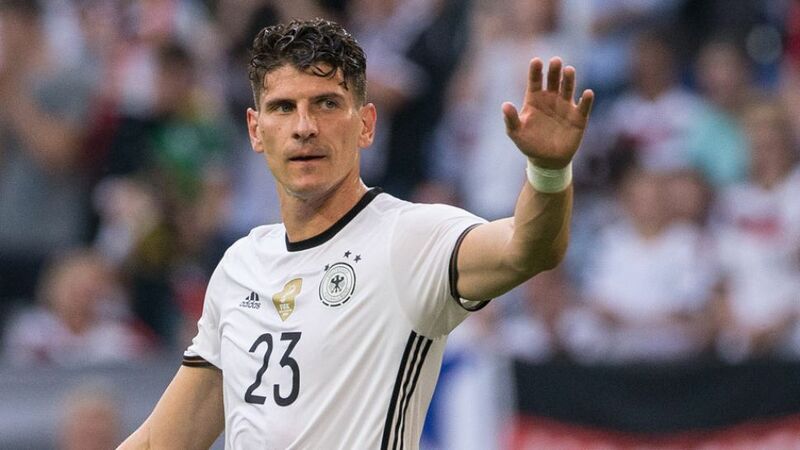 Germany's top scorer in 2016 with two strikes against England and Slovakia, Gomez would have had three goals in two games had his first-half header in the 3-2 loss to England in Berlin not been wrongly ruled out for offside. Following his international hiatus Gomez now has 27 goals in 64 caps. With Klose now retired from the national team and Gomez in the form of his life, it would not be safe to bet against him adding more goals and perhaps silverware to his footballing CV. "The coach will decide who plays, and if he calls on me, he'll get everything out of me. I am confident in our team. My ambition is great," he said. The teams in France this summer have been warned.